Buying undervalued assets results in positive valuation returns. Buying overvalued assets results in negative valuation returns. A number of market developments have had an impact on valuations since the last month-end. Non-US equity markets and currencies have fallen in value – so that certain equity markets that were undervalued have gotten more so. Overvalued currencies such as the Euro have gotten less overvalued. This has pushed up the expected valuation return for non-US equities. Small cap stocks globally have underperformed their large cap counterparts. This means non-US small caps offer better value today than before. 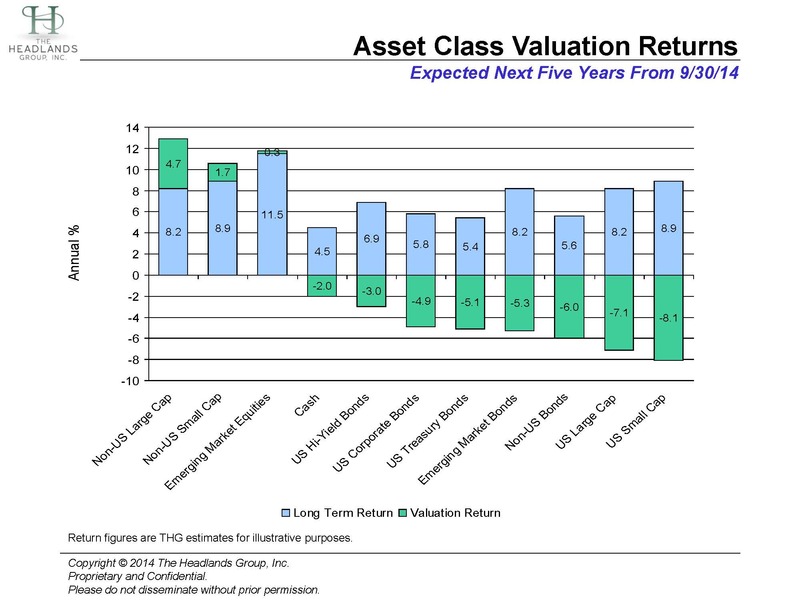 Their value is closer to that of non-US large cap stocks, which continue to lead all asset classes in attractiveness. At the other end of the spectrum, underperformance of US small caps has reduced their overvaluation to a greater degree than US large cap. Rising interest rates and Fed discussions of ending the QE program have pushed fearful investors out of high yield bonds. This has widened their spreads relative to Treasury bonds and makes them less unattractively priced in absolute terms.